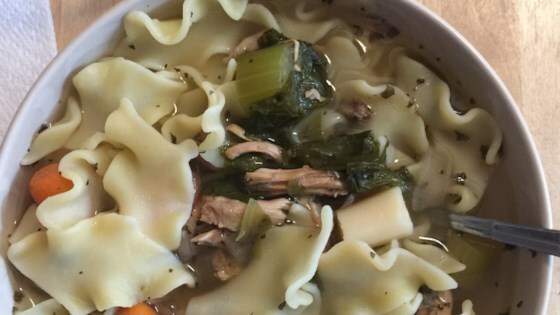 "This soup my Grandmother used to make when we didn't feel well. I have doctored it up a bit." Place chicken in a large pot and cover with water. Place celery leaves in pot and bring to a boil, then reduce heat and simmer until chicken is cooked through, 30 to 40 minutes. Remove chicken from pot and place in a bowl until cool enough to handle. Meanwhile, strain the cooking liquid, discard the celery tops and place the cooking liquid in a large pot. Place celery, carrots, onion, bouillon, soup mix and chicken broth in the pot and let simmer. Season with thyme, poultry seasoning, basil, peppercorns, bay leaves and parsley. Bone chicken and cut up meat into bite-size pieces. Return meat to pot. Cook until vegetables are tender and flavors are well blended, up to 90 minutes. Stir pasta into pot and cook 10 to 15 minutes more, until noodles are al dente. Serve hot.